It is with great enthusiasm that I announce a new initiative that Illinois Humanities has been working on for the past two years. Created and facilitated by Illinois Humanities, Envisioning Justice will engage Chicagoans of all neighborhoods, races, socio-economic backgrounds, and with a diversity of perspectives, in a citywide conversation about the impact of incarceration in local communities and will invite residents to use the arts and humanities to devise strategies for lessening this impact. Envisioning Justice seeks to strengthen efforts to reimagine our criminal legal system and is inspired by the goals of justice, accountability, safety, support, and restoration for all people. At the heart of Envisioning Justice are seven hubs in communities among the most directly affected by incarceration — including Cook County Jail and the Juvenile Temporary Detention Center. We held a press conference on April 3 at the historic Roberts Temple Church of God in Christ in the Bronzeville community. I can’t do the hub leadership justice by just telling you about the organizations and communities. 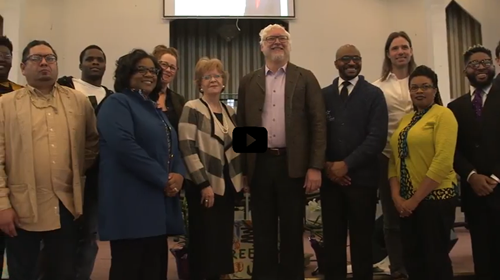 So, please watch the press event video and learn more about what’s happening in these communities directly from our hub directors and leadership. One of our goals for Envisioning Justice is to create city-wide engagement that will spark conversations involving all Chicagoans. You can join the conversation online at envisioningjustice.org by sharing your story, submitting a resource, and/or applying for a grant. Also, please mark your calendar for the Community Open Houses listed below. The Open Houses celebrate the culmination of a ten-week session of arts education classes and community discussion programs. Stop by to see how these communities across the city are using the arts and humanities to envision positive changes to the criminal justice system.